For most Minnesotans, it’s the winter season with basketball, hockey, Nordic skiing, downhill skiing (if you can find enough snow) and all the activities we associate with this time of year. For some of us, it’s just a time to stay warm until baseball season begins. For our family and thousands of others it’s walk season. 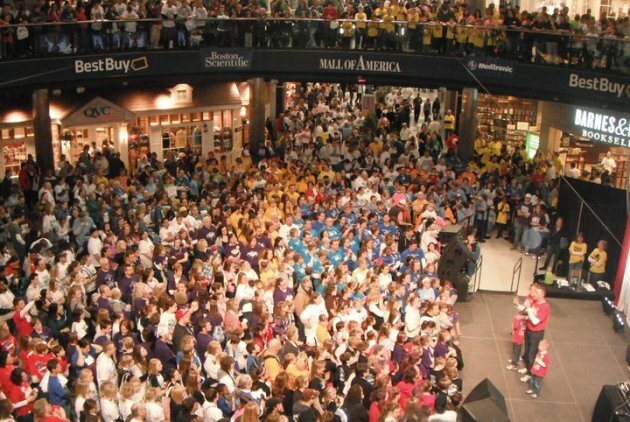 Not just any walk, but The Walk to Cure Diabetes at 8 a.m. Saturday, Feb. 25, at the Mall of America, sponsored by the Juvenile Diabetes Research Foundation (JDRF), MinnDakotas Chapter. Like those families, we have a special reason to participate. My wife Ann was diagnosed with Type I (insulin dependent) diabetes in 1984, just as she was finishing graduate school. Despite the many complications of diabetes, she was able to travel first to China to adopt our daughter Sadie and then to Vietnam to get Evie to make our family. The girls have never known her without serious health issues resulting from diabetes including heart problems, neuropathy or lack of feeling in her legs, a deteriorating ankle and kidney failure, to name a few. In 2001 she had a kidney transplant (generously donated by a loving older sister) and a few weeks later a pancreas transplant (donated anonymously by someone who had died). Miraculously, she now has normal kidney function and her pancreas produces insulin so she no longer needs to take four shots a day. The transplants at the University of Minnesota stabilized her condition, but she continues to suffer from many complications and takes two dozen pills a day. Since they were in strollers, Evie and Sadie have participated in the walk to support their mom and the thousands of other families who have loved ones with diabetes. As many as three million people, many of them children, have Type 1 diabetes in which the pancreas stops producing insulin, a hormone that enables people to get energy from food. Another 20 million, mostly adults but an increasing number of children, have Type 2, a metabolic disorder in which a person’s body still produces insulin but is unable to use it effectively. The disease is a major contributor to kidney failure, heart attacks, nerve damage, strokes and blindness and it’s estimated that diabetes accounts for more than $170 billion in health care costs annually. Our girls, now 16 and 13, are no longer passive participants in the walk. They help organize our team, Conroy’s Cruisers (named for Ann), cajole their friends into participating, raise money and make t-shirts, among other walk activities. They like the excitement of the 22,000 other walkers, the bands and jugglers and sports mascots and, of course, hanging out at the Mall afterwards. But they also feel a sense of solidarity with the other families because they know what families who have members with diabetes face on a daily basis. The walk is about taking a concrete step towards curing this dreaded affliction through research. It is about providing hope for those kids and their families that someday they won’t have to take four shots a day or check their blood sugars constantly or suffer insulin reactions or face the prospect of losing their kidney function or their eyesight. Hope that someday they can live lives just like their friends who joined them on the walk. Although she can still walk on her own, Ann often uses an electric scooter to get around places like the Mall. She’ll have the scooter at this year’s walk. She’ll use it to zoom around, which makes this year’s walk more like a Race to Cure Diabetes. Amid the legal wrangling, where was the concern for individual health care? Stone has been a journalist for print and broadcast, a U.S. Senate press secretary, a college relations director, a journalism teacher and a freelance writer and consultant. He's currently a communications and media consultant and a freelance writer. Read more about Doug Stone. Once again the Senate has failed to extend unemployment benefits for a meager three months for 1.7 million long-term unemployed Americans, who since the end of December have been without any financial help from the richest country in the world. It's been a couple days since I said my tearful goodbyes to 10 international journalists with whom I had the pleasure to meet, befriend and travel with as part of a nine-week program called the World Press Institute, based at the University of St. Thomas. Sadie came into our lives on a December day in 1995 at an orphanage in Xiamen, China, in the southeastern part of the country across the water from Taiwan. She was six months old and couldn't hold her head up by herself. This weekend, 17 ½ years later, we dropped her off at Monmouth College, a small liberal arts school in Monmouth, Illinois, where she starts a new phase in her life. How did it happen so fast? All those swim meets, basketball games, softball tournaments, school programs, birthday parties, water ski shows, doctors' visits, family vacations, grade school, junior high and high school graduations and all the rest are over. Just like that. In his now famous speech in 2011 during the debate over the marriage amendment, former Republican Rep. John Kriesel said, "When my grand kids look at me, I will be proud to look at them and say you know what, I was on the right side of history." And now the Minnesota House, caving to gun rights supporters, joins the U.S. Senate in failing to expand background checks for purchasing guns at gun shows. At least the U.S. Senate voted on a similar measure, which failed by six votes.